First thing I did at my parents is to solder all amp connections. Then assembled everything together and started searching for a deasant pole. The mount for the pole is fence wire (correct word ?) waiting to be used (See the pictures). The first readings between the 2:1 SWR points are 6319 and 6372 kHz. That is about 53 kHz usable bandwidth. 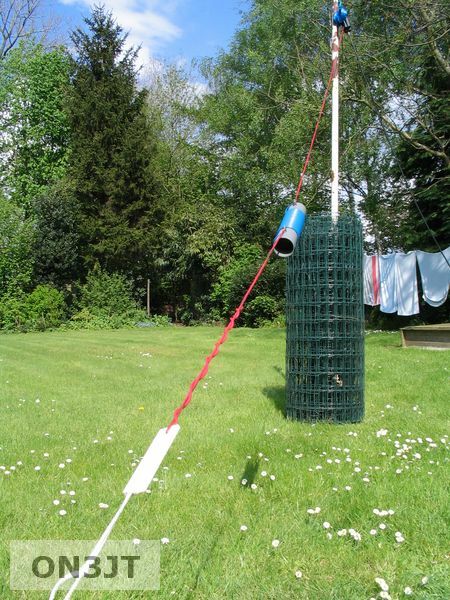 Keep in mind that the antenna is mounted near/on the ground and has metal close by. 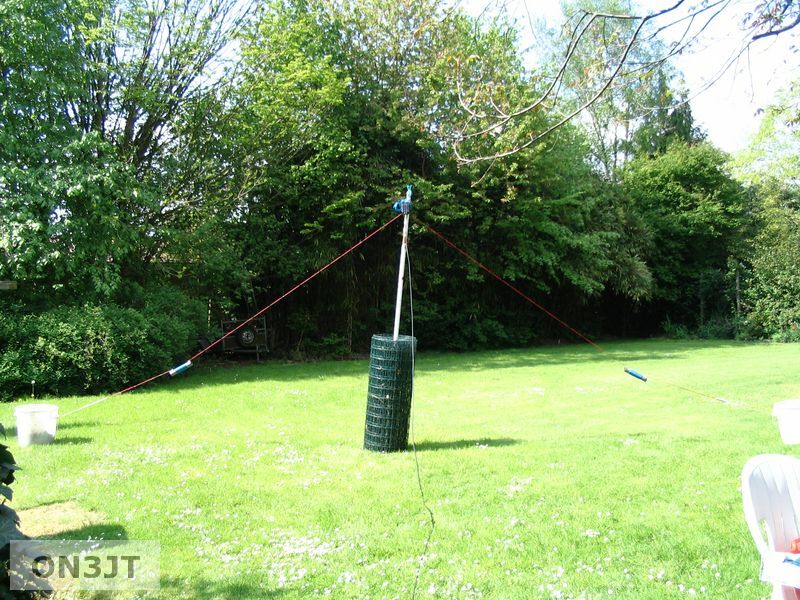 The total length of the antenna is about 8 meter. Will the bandwidth raise if I make the antenna longer ? Back to the K7MEM site and start modelling. The inner elements are now 2,85 meter. I added 65cm on each inner element. It now has a bandwidth of 60 kHz. We just won 7 kHz…. Not much compared to the length we added. I’ll stick to the first length of 2,85m. It has a practical use : the mounting pole can be smaller. Part 3 of this project will be written if the antenna is installed on the roof, probably in june or july. I’ll first have to build a remote antenna switchbox because I will not run 5 or 6 coax cables in a small ventilation shaft. This entry was posted on Sunday, May 4th, 2008 at 19:57 and is filed under Antennas. You can follow any responses to this entry through the RSS 2.0 feed. Responses are currently closed, but you can trackback from your own site.